Since 2007, NFL teams that start the season 0-2 can pretty much kiss the playoffs goodbye, with just nine teams having made it to the playoffs. Of those nine, just one, the 2007 New York Giants, has won the whole enchilada. And while the advice in this column can range from dumb to dumber, it may get a hit every once in a while, (read: Ty Montgomery). Seeing how that means I am hitting at the Mendoza line, let’s move on to the terrible advice in Week 3. Dropping a pair of touchdowns against the Chargers is one thing. Dropping four on the Cowboys is another. Trevor Siemian is going to be the hottest quarterback off the waiver wire this week, and with good reason. 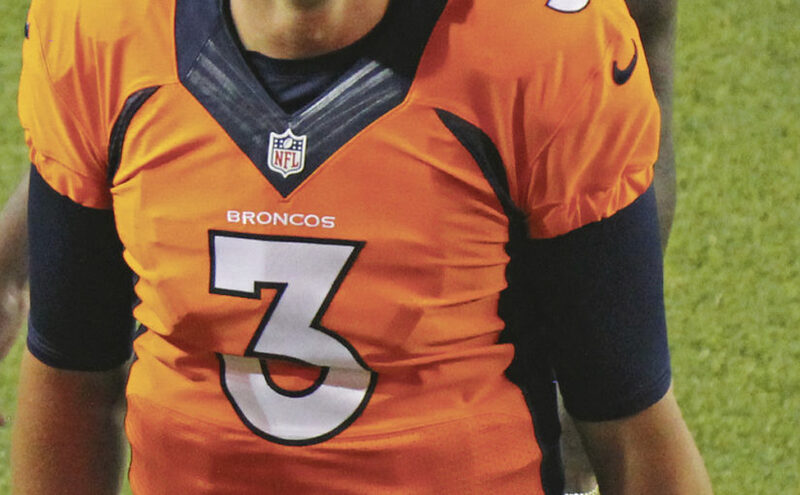 Siemian has six touchdowns in two games, and threw for over 200 yards passing in each. However, just remember why he is on the waiver wire in the first place. A pick and fumble made last week a little sour for the Bronco signal caller. Sunday’s opponent, the Buffalo Bills, have just one turnover this year and could be easy pickings for the Broncos. Excuse me for being a bit disappointed. Matt Ryan, more was expected of you against Green Bay. That can be excused due to the solid state of Atlanta’s running game. Ryan will remain a top quarterback for the rest of the season. That includes a trip this week to Ford Field in Detroit. If there is one thing that the Lions do, it’s put up points at home. The Falcon’s offense is just as explosive, so more things are expected of Ryan. Other notes: Only four quarterbacks have ever opened a season with a pair of 300 yard, multiple touchdown games. Ron Jaworski, Randall Cunningham, Donovan McNabb and Carson Wentz this year. Cam Newton has had a poor fantasy start, but it gets easier with New Orleans coming to town. If you are reading this, then it is probably too late. Chris Thompson figures to be just as hot of a commodity as Siemian. With Rob Kelly questionable with a rib injury, Thompson is in line for a good amount of touches this week. He is in line to be used more as the pass catching back to complement the Samaje Perine ground attack. Washington has a tough call against a stout Oakland run defense, so Thompson is just worthy of a flex play. It was a rough week for Jordan Howard owners. After Week 1 saw Howard lose touches to Tarik Cohen, it got worse last week. After being limited in practice, Howard had just nine carries for a torrid seven yards. That is one less than Ezekiel Elliot. He was spotted in a sling after the game, but his status with Cohen’s rise and Chicago’s awful offense is in question. Other notes: Last year, LaGarrett Blount led the NFL in touchdowns as the power back in New England. Now, Mike Gillisee looks to have taken over that role. There is still no winner in the ‘replace David Johnson raffle’ in Arizona, but Chris Johnson led the three backs in yards last week. Vikings quarterback Sam Bradford is listed as “day-to-day” by head coach Mike Zimmer. Same can be said about the fantasy value of Stefon Diggs and Adam Thielen. Both were capped by the lack of production that comes from Case Keenum. And there is still not a lot known about the Tampa Bay defense, other than they gave up a lot of yards during garbage time in Chicago. The bad news for Carolina fans is that the Panthers lost Greg Olson to a foot injury last week. It is hard to replace a top-tier tight end in the NFL with a backup, so expect more output from the Panthers’ receiving group. Devin Funchess looks to be the top benefactor and is a solid play against a weak Saints secondary. Other notes: When Jermain Kearse got traded to the Jets, he slotted in quickly as the top receiver. He now has more touchdowns than his old team Seattle, making him a waiver wire target. J.J. Nelson looks like he is the spark plug for the sputtering Arizona offence. If there is a team that needed a change, it was the Bengals. Now that Cincinnati has changed offensive coordinators, there is some light at the end of the tunnel. Hopefully, that means it is time to expect some production from Tyler Eifert. After a scoreless opener and just 42 yards in Week 2, patience is required, and it likely won’t be there this week against the Green Bay.